Signing Smart Diaper Bag Dictionary Series is the perfect traveling companion to tuck away and take along with your signing baby or toddler. 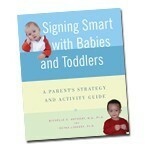 This collection of easy-to-read photographs of signing adults and toddlers is simple to learn from and fun to use! Pull them out to remind yourself of relevant family-friendly signs at the moment you need them, or plop down on the floor with your child and let these adorable photos engage you both again and again! 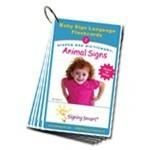 These durable flashcards are on a convenient-to-carry ring and have photos of adults signing on one side (includes description of how to form the signs), and toddlers signing on the other side (so you can see what signs look like coming back on little hands). The easy-to-flip-through ring makes mixing-and-matching, carrying the cards, and finding the exact sign simple! No more bulky cumbersome dictionaries with difficult-to-read line drawings! All cards are ASL signs. Each set includes its own unique Signing Smart Strategies card. Leave a self-selected ring for your child care provider or babysitter to make communication a snap while you are away. Or slip the cards into a photo brag book to custom make relevant children's books. Parents and child care workers alike are sure to love them, and they make great baby shower, new baby, or first birthday gifts as well! 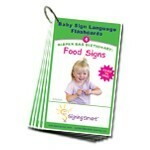 Promotes early communication and vocabulary development. 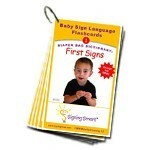 For hearing or Deaf children, ages 2 months - 5 years. 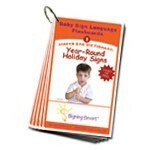 In the enclosed Signing Smart Year-Round Holiday Signs collection, there are over 30 of the most intriguing, prevalent , and difficult-to-find holiday/seasonal items for you and your child to discover and talk about together! Signs include: BUNNY; CANDLE; CANDY; CHRISTMAS; AUTUMN; FIREWORKS; GHOST; HALLOWEEN; HANUKKAH; KWANZAA; LEAF; NEW-YEAR; PASSOVER; PUMPKIN; SANTA; SNOW; SPRING; SUMMER; THANKSGIVING; TREE; TRICK-OR-TREAT; TURKEY; VALENTINE'S-DAY; WINTER; and more!